One of the most popular and most asked questions since I’ve started this blog is if I can recommend some good hacking books to read for beginners and more experienced hackers and penetration testers. In this article I want to highlight some hacking books and InfoSec books that I personally liked that cover subjects such as ethical hacking, penetration testing, web application penetration testing and other InfoSec related subjects. In addition to college degrees, certifications, hacking courses, taking up challenges and practical training, books are an invaluable source of information to keep your knowledge up-to-date and acquire new skills. Whether you’re a beginner in the field of InfoSec or a seasoned professional, mastery of new skills will open up many doors and allow you to progress in your career faster. The secret of becoming a (better) penetration tester, bug bounty hunter or IT professional is to not only focus on penetration testing books but also read books on related subjects such as: Networking, programming, exploit development, web applications, network security monitoring and other IT subjects. Having at least a little theoretical knowledge about these subjects helps you a lot to look at information security from different angles and perspectives. For this reason I will not only list hacking books in this article but also books on related subjects that I deemed important enough to read. In my opinion every serious IT professional should be reading at least a book per month and I hope that this article will help you discover your next InfoSec book to read. Please note that the listings of the books is not a ranking but a mere overview of hacking books that I recommend to the Hacking Tutorials readers. I will update this article on a regular basis with new books. Would you like to see a specific book added to the list or even your own book? Please leave a comment below and I will add it to the list. Finally, I have included Amazon affiliate links underneath each book review which will generate a small commission for Hacking Tutorials when buying the book through this link. If you prefer to not buy the book through these links, please browse to Amazon and use the search function to lookup the book. 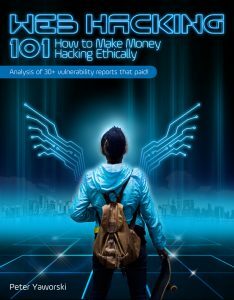 The first book I would like to recommend is a hacking book that has helped many people to make their first steps into ethical hacking and penetration testing. 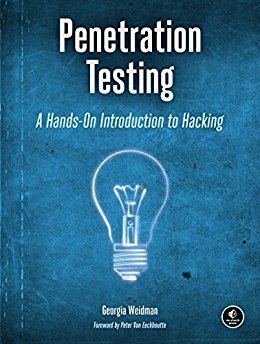 Penetration Testing: A Hands-On Introduction to Hacking is written by Georgia Weidman and is a good book for anyone new to the subjects as it generally focuses on beginners. The author of this book covers many different subjects such as setting up a lab to enumeration, exploitation, mobile hacking and a lot more. What I personally like about this book is that the author explains every step in the process in detail and also relates it to her wide experience in the field as a penetration tester. So if you’re new to penetration testing without prior experience, this book is a great place to start an exciting journey! According to the author on Twitter she’s currently writing an updated V2 version of this book, follow her for updates! While this book is still greatly appreciated by many (including me) and helped many people making their first steps into the field of penetration testing, some parts of the book (including the URLs) are a bit outdated. If you’re fine with this, make sure that you check the updates for this book on the authors website. Otherwise I would recommend to wait until the updated V2 of this book is released. This fantastic web app hacking book is a must read for anyone that is interested in web application penetration testing and covers everything you need to know about this subject. 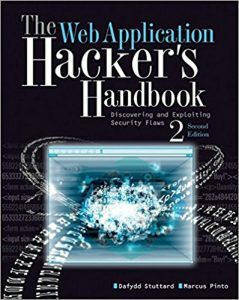 The Web Application Hacker’s Handbook: Finding and Exploiting Security Flaws 2nd Edition is written by the founder of Portswigger which is the company behind the popular security testing & scanning tool called Burp Suite. This book teaches you step by step how to test the security of web applications from start to finish. One thing I particularly like about this book is that it explains different web technologies, how to exploit them and how to defend against the attack in particular. Furthermore this book covers the very basics a web application penetration tester needs to know in depth, such as how the HTTP protocol works in order to get a better understanding of communications between a webserver and visitor which helps in understanding attacks and defense. If you have read my blog before or follow me on Twitter you would know that I’m a big fan of this book. In 2017 I have read this book and wrote a book review article here on Hacking Tutorials. 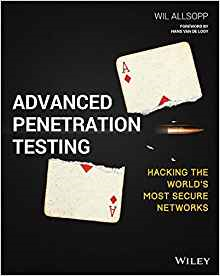 This book might not be the first book for beginners to read although it puts everything you read about penetration testing in the right perspective. In this book the author covers complex attack simulation and Advanced Persistent Threat (APT) modelling featuring techniques that are way beyond using Metasploit and vulnerability scanners. IT covers subjects such as social engineering, highly secured networks, malware, creating and setting up C2 servers and C&C structures and even advanced data exfiltration techniques. Each chapter describes APT modelling against an organization in a specific industry such as a hospital, pharmaceutical company or bank. The break down in industry also gives the reader a clear view how specific industries have different assets to protect, how they are protected and by who. Finally the author is a very experienced penetration tester/red teamer so the examples and context of the scenarios provided in the book come straight from the field. MUST READ! Written by the ultimate group of top security experts this book covers everything you need to on how to find security holes in operating systems and applications. You’ll work with the basic building blocks of security bugs, assembler, source code, the stack, the heap, and so on. The prerequisites of this book require you to have basic programming knowledge and understanding of IT concepts but in my opinion this is not enough. This books is expertly written without much introductions or basics which makes this book a pretty hard one to read and definitely not a joke. If you have a good understanding of programming concepts, x86, assembly, exploit development and want to learn more about various types of advanced exploits like stack overflow, heap overflow and exploit development, Return Oriented Programming, Fuzzing, ASLR/DEP handling and a lot more, this book is for you. If you have less technical knowledge and you’re a beginner on these subjects you’ll probably end up researching a lot of this stuff as a side effect of reading this book (which is not a bad thing though!). 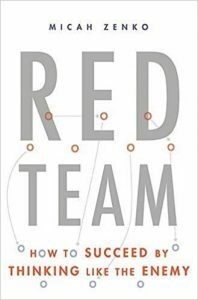 Red Team: How to succeed by thinking like the enemy is written by national security expert Micah Zenko. In this book the author provides in-depth information about the work of red teams, how they operate, the best practices and most common pitfalls, and effective applications of the modern-day Devil’s Advocates approach. 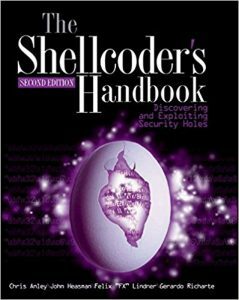 At first you might be wondering why I list this book in a hacker/InfoSec book overview as this book does not cover any technical subjects or red teaming tools. But, when you’ve read this book you’ve learned how best practices of red teaming can yield impressive results by thinking like the enemy and considering alternate analysis to reveal weaknesses in systems and processes. What I also like about this book is that the author covers many business scenarios and shortcomings from his experience that anyone who has worked in mid-size or large organizations can relate to. The book also includes a lot of examples of effective and ineffective red teaming exercises and a clear lessons learned review from these exercises. So if you’re looking for a great introduction to red teaming and you’re interested in the history of red teaming, the theory behind it, best practices and pitfalls, critical thinking and alternate analysis, and how to operate red teams, this book is a must read. Web Hacking 101 is written by Peter Yaworski (with a foreword by HackerOne Co-Founders Michiel Prins and Jobert Abma) and explains common vulnerabilities found in web applications using publicly disclosed vulnerability reports on bug bounty programs. The book covers vulnerability reports on Cross site scripting (XSS), Cross site request forgery (CSRF), Remote Code Execution (RCE) and many more vulnerability types. Each report is analysed by the author and includes details about the vulnerability, a clear description and the reward that was paid. With this book you won’t just learn about the vulnerabilities and how they were exploited but also their context, the impact and how to recognize them on your own bug bounty hunts. Finally the book also provides an overview of bug bounty platforms, tools, blogs and some cheat sheets to get started with bug bounty hunting right away. The book is available at Leanpub.com for as low as $9.99 which is a great value for the money. 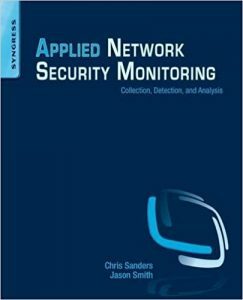 Applied Network Security Monitoring is a great practical guide into Network Security Monitoring (NSM) that covers the subject from the ground up. This great book helps you to become an NSM analyst and teaches the key concepts of NSM accompanied by many practical tutorials and real life examples. Applied Network Security Monitoring is one of the best books I’ve read on this subject so far. The authors of the book, Chris Sanders & Jason Smith, are very experienced in the field on Network Security Monitoring and also know how to teach it to others in a way that is very attention holding and easy to understand if you’re new to the subject. They almost make NSM look easy! The author also offers online courses and training on his website that are definitely worth checking out (See training section on Chris Sanders website). Finally the book is divided into three primary sections (Collection, Detection, & Analysis) that takes you through all stages of the NSM process. Each sections contains practical examples and hands-on coverage of the tools needed which makes it very easy to learn the practical side of NSM alongside reading the book. The book provides thorough hands-on coverage of Snort, Suricata, Bro-IDS, SiLK, PRADS, and many others tools. Celebrate SysAdmins With Savings from The Linux Foundation! 2 courses and 1 certification in each bundle: $325 each! We’ll even give you a free T-shirt with every purchase! Celebrate SysAdmins With Savings from The Linux Foundation! Next National SysAdmin Appreciation Day!